To use or not to use mats for Montessori infant and toddler materials? 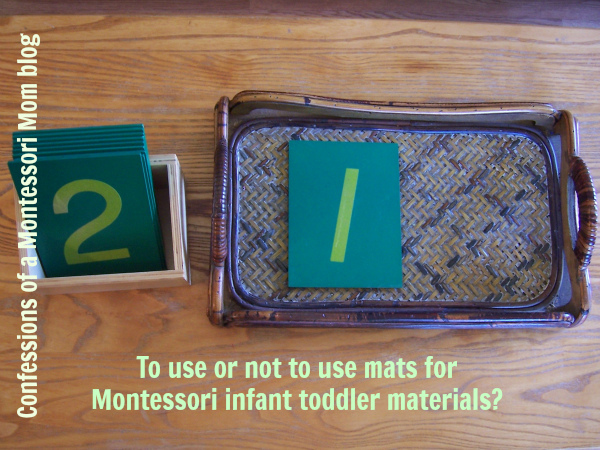 Should you use mats with your infant and or toddler Montessori activities? And what are the mats for, anyway? The reason for mats is to define the child's work space, to let other children know not to walk on, over, or through another child's rug with work (materials) on it; or if children are sharing a table or sitting side-by-side, not to touch each other's activity... ideally. A mat (or rug) also defines the work space for the materials themselves so they "do not get out of hand" (pink tower blocks strewn around the classroom!). Mats are optional in most infant and toddler classrooms (the teacher decides whether to have them in the classroom); and some Montessori preschool classes do not use them. Some toddler classrooms have rugs already out with works on or next to them, so the toddler does not get the rug. I do not use mats or rugs at home because my son's Montessori toddler teacher does not use them, and I want to be consistent.